Can someone who has spent most of his career writing and performing folk music produce a renaissance in worship music that is both contemporary and provides roots to the historical church while creating a new liturgy? We may be about to find out as Bob Bennett, a renowned guitar virtuoso and songwriter from California, revealed in a recent interview. 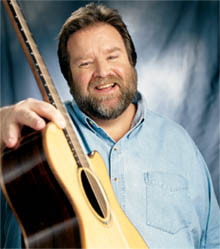 Bennett has authored both serious and lighter-hearted folk songs that often poke fun at our human frailties and the “games” we sometimes play within the church. During the month of February, the Mariners Church in Irvine California paid homage to the “Jesus Movement” of the seventies that launched a multitude of bands and churches in California. Bob Bennett was front and center leading worship during the first service of the four-week series singing songs that as he says haven’t been heard by most people in almost twenty-five years. Randy Stonehill also participated in the series. Bob Bennett, much like his friend Steve Bell, has always been thought of as someone who marches to the beat of a different drummer; not for the sake of being controversial but for the sake of reforming what they see as real short-falls in the music industry. Neither of them adopts a negative perspective but they instead choose to push the envelope causing us to think and rethink what many of us have always accepted without questioning. Recently, Bennett played a return engagement at the legendary Cup O Joy in Green Bay, Wisconsin. He first performed there in the fall of 2004 with his friends Canada’s Carolyn Arends and Bruce Caroll of Memphis. The first date was an in the round setting in which the three artists appeared on stage at the same time and traded songs and stories back and forth. It was a huge success and Jan Oettinger, who books the acts for Cup O Joy, invited him back for his solo performance in February. “Bob Bennett is one of a kind... a guy who can make you laugh or bring you to tears with his stories and wordy, thoughtful songs,” says Oettinger. By Joe Montague, exclusive rights reserved This material may not be redistributed without prior written permission from Joe Montague.